The Sternoclavicular (SC) joint is the only bony joint that connects the axial and appendicular skeletons. The SC joint is a plane synovial joint formed by the articulation of the sternum and the clavicle. Due to the joint’s articulation between the medial clavicle and the manubrium of the sternum and first costal cartilage, the joint has little bony stability. Between the medial clavicle and the manubrium is a dense fibrocartilaginous disc that separates the joints into two distinct synovial compartments. The intra-articular ligament provides joint stability and prevents medial displacement of the clavicle. This ligament originates from the junction of the first rib and sternum and passes through the SC joint and attaches to the clavicle on the superior and posterior side. The anterior and posterior sternoclavicular ligaments restrain anterior and posterior translation of the medial clavicle. The anterior and posterior sternoclavicular ligaments originates on the anterior and posterior ends of the clavicle, respectively, and inserts onto the anterior and posterior surfaces of the manubrium, respectively. The SC joint is supported superiorly by the interclavicular ligament that connects the superomedial portions of each clavicle. The blood supply to the SC joint is from the articular branches of the internal thoracic and suprascapular arteries. The SC joint is innervated by the branches of the medial suprascapular nerve. The brachiocephalic trunk, common carotid artery, and the internal jugular vein all lie directly posterior to the SC joint. Figure adapted from: Higginbotham TO, Kuhn JE. Atraumatic disorders of the sternoclavicular joint. Journal of the American Academy of Orthopaedic Surgeons. 2005;13:138-145. Patients with SC joint dysfunction can be classified into two categories based of the mechanism of injury: traumatic or atraumatic. Traumatic injuries to the SC joint range from minor subluxation to complete dislocations. Injuries to the SC joint are rare and infrequently seen in physical therapy. Full dislocation of the SC joint is rare due to the large amount of force and specific vector required to displace the joint. Typically, traumatic injuries to the SC joint occur during: falls, sports-related injuries or vehicular accidents. 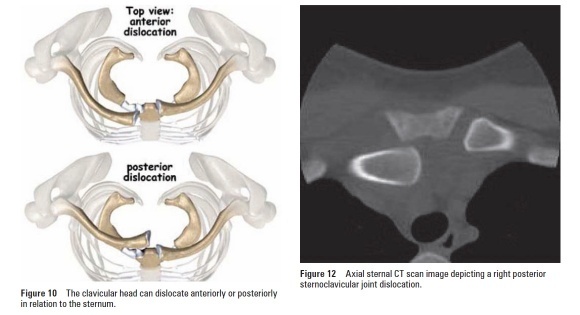 Anterior SC joint dislocations are more common. Posterior dislocations have serious clinical implications as the surrounding nerves and vessels may be compromised. The SC joint is vulnerable to the same disease processes than occur in joints such as degenerative arthritis, rheumatoid arthritis, infections, and spontaneous subluxation of the joint. A thorough history is required to determine the presence of non-musculoskeletal disorders. Patients usually present with complaints of pain and swelling. With mild sprains or subluxations, there may be complaints of instability in the joint. Often with dislocations, a palpable and observable step-off deformity at the SC joint may be present. Posterior dislocations may be associated with more significant symptoms such as: a feeling of compression of the trachea or esophagus, complaints of dyspnea, choking, difficulty swallowing, or a tight feeling in the throat. In the most severe cases of posterior dislocation, complete shock or a pneumothorax may occur and if left untreated and can be associated with complications such as thoracic outlet syndrome and vascular compromise. Type I injury is associated with mild to moderate pain associated with movement of the upper extremity. Instability is usually absent and the SC joint is tender to palpation and may be slightly swollen. Type II injury is associated with partial tears in the supporting ligaments. The joint may sublux when manually stressed but will not dislocate. Patients report more swelling and pain than those with Type I injuries. Type III injury results in complete dislocation, either anteriorly or posteriorly, of the SC joint. Patients report severe pain that is aggravated by any movement of the upper extremity. The involved shoulder may be protracted in comparison to the uninvolved side. Patients may also hold the affected arm across the chest in an adducted position and support the involved arm with the contralateral limb. Osteoarthritis (OA) of the SC joint includes: a report of pain and swelling at the SC joint that is aggravated with palpation, ipsilateral shoulder abduction, and/or shoulder flexion about the horizontal. Other findings include: osteophyte prominence at the medial end of the clavicle, creptius, or a fixed subluxation. Degenerative processes of the SC joint become increasingly more common with advanced age. Postmenopausal women are more susceptible than premenopausal women or men. Rheumatoid arthritis, RA, of the SC joint includes: a report of swelling of the SC joint, tenderness of the SC joint, crepitus, and painful limited movement of the shoulder. Other findings include synovial inflammation, pannus formation, bony erosion, and degeneration of the intra-articular disc. Isolated joint involvement is rare. It is more common to see multiple joints affected with RA and often is present bilaterally. Infection of the SC joint include: report of pain, swelling of the SC joint, tenderness around the SC joint, fever, chills, and/or night sweats. A definitive diagnosis is found with aspiration or open biopsy. Septic arthritis is associated with infection of the SC joint and is seen in patients that have RA, sepsis, infected subclavian central lines, alcoholism, or HIV. It is also seen in immunocompromised patients, renal dialysis patients, and intravenous drug users. Spontaneous anterior subluxation includes: patient report of a “pop”, or sudden subluxation of the medial end of the clavicle. It is commonly seen in patients in their teens and twenties who demonstrate ligamentous laxity and may occur with overhead elevation of the arm. The clinical presentation of seronegative sponyloarthropathies is similar to that of patients with ankylosing spondylitis, psoriatic arthritis, Reiter’s syndrome, or colitic arthritis. This disorder is characterized by age of onset before 40 years old, inflammation of large peripheral joints, and absence of serum antibodies. Patients present with unilateral involvement, swelling, and tenderness of the SC joint, and pain with full arm abduction. Sternocostoclavicular hyperostosis includes soft tissue ossification and hyperostosis, or excessive growth of bone, between the clavicles. A patient with sternocostoclavicular hyperostosis may report localized pain, swelling and warmth over the SC joint. Symptoms are often bilateral and the range of motion of the shoulder can be affected. Condensing osteitis includes: patient report of pain and swelling over the affected area. Symptoms are usually unilateral and present in women in their late child bearing years. This condition presents with sclerosis and enlargement of the medial end of the clavicle. Friedrich’s disease (aseptic osteonecrosis) includes: discomfort, swelling, and crepitus of the SC joint in absence of trauma, infection, or other symptoms. The patient reports loss of ipsilateral shoulder range of motion. Plain radiographs are indicated at the initial evaluation for SC joint disorders. Computed Tomography (CT) scans are indicated for disease processes in which there is bony destruction or ossification. Magnetic Resonance Imaging (MRI) provides information of whether there is inflammation, soft tissue masses, or osteonecrosis are present. While a MRI radiograph is very thorough, CT is a preferable imaging modality in acute settings due to speed, availability and ability to discern between soft-tissue and bony injuries, especially in acute scenarios. Laboratory studies may help rule in or rule out a certain diagnosis when inflammatory or infectious disease processes are suspected, such as RA, septic arthritis, or osteomyelitis. Radiographic evaluation for SC joint dislocations includes standard antero-posterior (AP) radiographs of the chest that may suggest and injury to the SC joint. This may, however, not be the best view for visualization of the joint. The use of the serendipity view radiograph has been shown to be of better diagnostic reliability since it is a bilateral view of the SC joint. Figures adapted from: Bontempo N, Mazzocca A. Biomechanics and treatment of acromioclavicular and sternoclavicular joint injuries. British Journal of Sports Medicine. April 2010;44:361-369. Little evidence exists for the optimal management of SC joint dysfunction, but may be impairment and patient-response driven. The physical therapist may consider exercises, manual therapy techniques, education or other treatment interventions based on the observed impairments. Often times, SC dysfunction does not require an extensive course of physical therapy. In severe, acute traumatic dislocations, reduction of the joint may be required by the appropriate medical provider. Posterior dislocations of the SC joint should be considered a medical emergency due to the proximity of major arteries, nerves, trachea, esophagus and lungs. Before actual physical therapy is applied, the clavicle should be placed back into the Sternoclavicular joint. When the patient has an anterior dislocation, most authors recommend at least one closed reduction attempt. This reduction may be performed under local anesthesia, under sedation, or under general anesthesia. Place the patient with his arm supine and with a thick pad between his shoulders. The reduction entails abduction of the shoulder to 90 degrees, 10 to 15 degrees of extension, and traction on the arm with posterior pressure over the sternal end of the clavicle. When the patient has a posterior dislocation, closed reduction should also be applied under general anesthesia. There are several techniques described, the standard abduction traction technique is similar to the technique used for anterior dislocations. Place the patient with the shoulder of the injury side supine near the edge of the table with a thick pad between the scapulae. Apply lateral traction with the arm in abduction and extension. The clavicle can be grasped with the fingers to dislodge it from behind the sternum, if reduction is not succeeded. If the clavicle is still dislocated, use a towel clip to grasp it and it is lifted back into position. This procedure is always done with sterile technique. When the clavicle is reduced after a posterior dislocation it is usually stable. Surgical stabilization is not recommended by most authors because of the risks for complications such as infections. This type of stabilization should only be used in patients who have failed conservative treatment. On the 4th day after surgery start gentle physical therapy. This therapy should be focused on passive glenohumeral motion, including internal rotation and external rotation. If the joint is stable at week 3, start elbow exercises and glenohumeral rotation. These exercices include active flexion, extension, abduction and internal/external rotation as well as static strengthening exercises. To prevent the shoulder from dislocating again a good guideline is to keep the hand in view during the first three weeks. The first 6 weeks abduction or other significant SC joint motion is not allowed. After 6 weeks institute more aggressive range of motion exercises including overhead activities with slow integration of strengthening maneuvers. Beginning at 8 to 12 weeks, start a rehabilitation program of stretching and strengthening exercises. 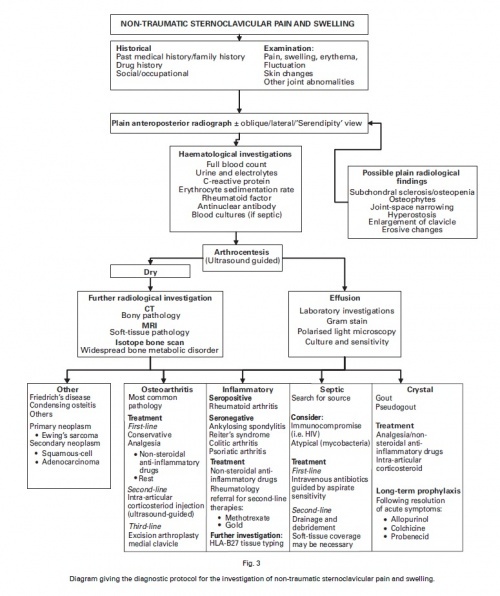 The figure below depicts a differential diagnosis flowchart for non-traumatic injuries of the SC joint. Figure adapted from: Robinson C, Jenkins P, Markham PBI. 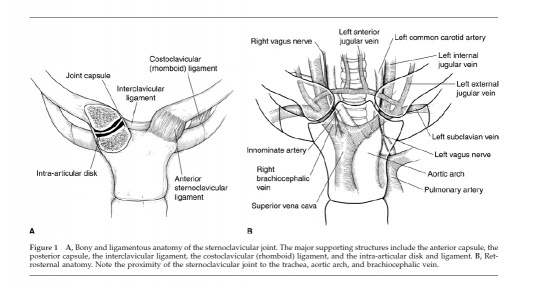 Disorders of the sternoclavicular joint. The Journal of Bone and Joint Surgery. June 2008;90-B(6):685-696. ↑ 1.0 1.1 1.2 1.3 1.4 Higginbotham TO, Kuhn JE. Atraumatic disorders of the sternoclavicular joint. Journal of the American Academy of Orthopaedic Surgeons. 2005;13:138-145. ↑ 2.0 2.1 Robinson C, Jenkins P, Markham PBI. Disorders of the sternoclavicular joint. The Journal of Bone and Joint Surgery. June 2008;90-B(6):685-696. ↑ 3.0 3.1 Wirth MA, Rockwood CA. Acute and chronic traumatic injuries of the sternoclavicular joint. Journal of the American Academy of Orthopaedic Surgeons. 1996;4:268-278. ↑ 4.0 4.1 4.2 Bontempo N, Mazzocca A. Biomechanics and treatment of acromioclavicular and sternoclavicular joint injuries. British Journal of Sports Medicine. April 2010;44:361-369. ↑ 5.0 5.1 Groh GI, Wirth MA. Management of traumatic sternoclavicular joint injuries. Journal of the American Academy of Orthopaedic Surgeons. January 2011;19(1):1-7. ↑ 6.0 6.1 6.2 6.3 6.4 6.5 6.6 MacDonald, e. a. (2008). Acromioclavicular and Sternoclavicular Joint Injuries. Orthopedic clinics of North America, 535-545. ↑ Kisner, e. a. (2002). The Shoulder and Shoulder Girdle. In therapautic exercise, Foundations and Therniques , 319-385. ↑ Gaunt BW, Boers, T. SC, AC, & spinal specific manual techniques can dramatically increase shoulder girdle elevation. Presented at: Combined Sections Meeting; Feb 10, 2011; New Orleans, LA.